Sid talks about the things we throw away and the things we keep. I discovered that a lot of the refuse of humanity settles in a place where the water brings it and where the wind brings it, trapped there by some other human convenience, like a fence or a drain cover. I filled two brown 55 gallon trash bags and part of a third in three hours. To the passersby I suppose we looked like people to be avoided, the sort of folks who find value in what the rest of us throw away. Mostly it was packaging for the ingestibles that are supposed to make us feel better, but by the looks of things, we can’t wait to get rid of before we escape the darkness on the edge of town. Me? Eat a Big Mac? No way. Out the window before anyone sees. Along with lots of beer cans and Styrofoam cups and fast food wrappers, somebody found a purple ladies undergarment, and I picked up an orange hypodermic needle, and the brown and white plastic bags were everywhere, every item the end of the line for a little human story. The grown-ups who came along later, there, to turn the story into something digestible, said it was maybe an old Indian skull, but no, by the next week it was more likely a white person’s skull, and if you give us another week or two, and we still have hold of your short little span of attention, we can tell you how old he was, what he had for lunch, and where he went to church. Couldn’t he just this once be a pirate? With a peg in his ear and the remnants a gold doubloon wedged between his last two teeth? Trapped below deck and set adrift in a sinking boat by rival scoundrels who seized control of the St. Joseph River just in time for a little action at Meet Me on the Island? What’s the matter with a little mystery once in a while? No we can’t have that. Highway excavators accidentally scraped open a grave. Okay. Oh, that reminds me. From right down the road, I have a cab story, and it’s a mystery that I will let you solve. It was a drizzly cold February afternoon and the dispatcher whose name I’ve decided should be Dennis, sent me over to the old Sunoco station out in front of Martin’s on Portage, just south of Elwood, you know the one where there are always so many cars in the lot you wonder how the mechanics get them in and out of there when a customer shows up to get his car back. Dennis said that when I get there I should expect to have some items to carry to the car and then move for the customer, which was not that big of a deal, in fact I wondered why he bothered to mention it. We carry laundry and groceries all the time. Cab driving, like talking on the radio, is not always the glamorous vocation that you imagine. When I pulled in I could see my client, standing on the elevated walkway near the door to the ladies room. It was a cold day, as I said, and yet she was overdressed, not overdressed like too fancy, overdressed like she was wearing all the clothes that you used to own and that she owns now: gloves, hats, and coats in multiples. Her face was dark, lined, and leathery. She had the aged but ageless expressionless face of the lost soul Native American woman pictured in a high school history book wrapped in a blanket sitting on the ground waiting for the caravan to Oklahoma. I deduced that my client lived outside and that she found value in what the rest of us throw away. And, as it turned out, she’d gathered some of that up. What she wanted me to carry were six used tires. Six tires with no tread. Six used tires. Getting six 25-inch full-sized American automobile tires into the cab was not easy. Two plus the one already in the trunk in the trunk, three in the backseat, that left one and my new companion for the front. 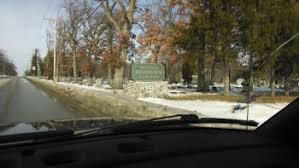 We turned into the Riverview Cemetery, me and the cab and the homeless lady and six used tires. She directed me, right, left, right, down gravel lanes past headstones all the way to the back, to where the cemetery ends at the steep bank of the Pinhook Lagoon. I helped her get the tires out of the car, and she paid the three dollar fare. I let Dennis, the dispatcher, know that my cab was empty, and that I was ready for my next call. Last year, my grandma died, my dad died, my car died, and my dog died. Out of all of these, the one I had the most trouble mourning was the dog. This is sort of surprising, because I never used to be a dog person. But then we had kids. And then one of our kids wanted a dog. And then everybody wanted a dog. My wife and I were having coffee at Barnes and Noble one night when it hit me. I said to her, “We’re getting a dog, aren’t we?” She just smiled. And the very next week it happened. April the dog adopted our family. Sometimes a person wants a big change. Life can get too easy or predictable. I’ve been married for 11 years to my handsome husband. We have two kids, one dog, two guinea pigs and a fifteen cent goldfish that could survive a nuclear bomb. I love my life but wanted something new. I wanted something younger and more exciting and so I did what anyone in my situation would do: I went online. Pictures say a thousand words and I spent several weeks swiping left or swiping right looking for that special someone. Before you judge me, you should know my husband was into it. Today, I offer an argument: States divide themselves one of two ways: by longitude, or latitude. For example, I grew up in Colorado, where the eastern flatlanders have little in common with western Coloradans who notch their belts by the lofty 14-ers they’ve climbed. And among western Coloradans, please don’t mistake the east-of-the-Continental Dividers from true Western Slopers. The Colorado state of mind is organized by longitude, fine-sliced on the vertical.